How far would you go to help a family member fullfill his or her dream? Would you climb underneath a running automobile while being dowsed with gasoline? Since the risk of serious if not fatal burns is so great, most of us would have some serious doubt about it. Just moments after climbing out of his car to celebrate his first Snowball Derby win on Sunday, Eddie Mercer found out that his little brother, Stevie, had silently put his life on the line to help get him to victory lane. It didn't take Stevie long to come up with an idea, one that only a very, very loving brother would agree to. Stevie ran back to the team's hauler and grabbed their spare firesuit, some gloves and some bubble goggles. Stevie's idea was to crawl under the car during the next pit stop and hold the valve in place from underneath the car which would allow the fuel to get into the fuel cell. The idea was not well received throughout the team's pit, but Stevie knew it was the only way to keep Eddie going and he was willing to do it. "I just kept saying 'don't tell Eddie, don't tell Eddie’ to the guys, because if Eddie found out what I was going to have to do, he would have called it quits for the day." On lap 145, with Eddie running on fumes, the decision was made to pit for fuel. For Stevie, it was "go time". "He pulled it in and I snuck underneath the car as quick as I could," said Stevie, "grabbed a hold of the valve and shut my eyes and mouth. It was awful, I had fuel pouring into my nose, into the goggles, just everywhere!" When Mercer and Freddie Query got together in the early stages of Sunday's Snowball Derby, most saw it as a harmless spin. Mercer didn't hit the wall, he got the car turned back around, ducked into the pits for some fresh rubber and got in line for the restart. His pitcrew however noted a potential disaster, but chose not to tell Eddie. When Query's car made contact with Mercer's left rear, it broke the drylock fuel valve which meant that no fuel could get into the car. "Basically, we were done. He was going to run out of fuel and our day would have been over, " said Stevie Mercer. "So we switched our radios off of Eddie's channel so we could discuss the situation and come up with a solution." While Stevie was laying under the car, covered in highly flammable racing fuel, his tire guys where hard at work changing the tires. "I just kept thinking about those lugnuts and how they can make a spark when they are removed so quickly, and the hot exhaust, I was just thinking of everything, it was scary!" With fresh tires and 10 gallons of fuel in the car, Eddie was back on the track, still unaware of the huge risk his brother had just taken for him. As Eddie was getting back into the pace line, Stevie was flushing his eyes while the crew poured water from the cooler on him to help dilute some of the fuel from his skin. 155 laps later, Eddie Mercer had become the 38th annual Snowball Derby champion, with the help of his little brother. 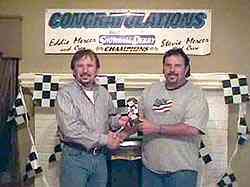 Eddie Mercer (left) gives an award to his brother Stevie (right). With just a handful of laps remaining, Brazier’s run again was halted by a pileup in turn 2. 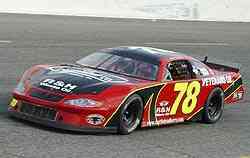 There is very little doubt that Eddie Mercer has one of the fastest cars at Five Flags Speedway on Sunday. So did Steve Wallace. So did Clay Rogers. Each of which finished in the top-three, behind Mercer. But there was on driver who appeared to have a car that could have matched any and all of the top-three drivers. That would be the #84 of Wayne Anderson. It was amazing that Johnny Brazier wasn’t dizzy by the end of the Snowball Derby. Brazier started third, ran with the leaders several times, but ended up spun around both early and late in the race. When he was able to stay at the front through pit strategy, leaders on new tires quickly sped past him. It was a difficult day for Brazier to say the least. Despite the issues, Anderson was in a very good mod following the race and called it one of the best Derbys he’d seen. Justin Drawdy did not get to race as much in 2005 as he would have liked, but there was one event that he was not planning to miss for the world. The 38th Annual Snowball Derby at Five Flags Speedway (FL) is the biggest short track race in the country and one that Drawdy had really looked forward to. What he got out of the event was a mixed bag. Drawdy qualified his #12 Drawdy Brothers Construction car an impressive sixth out of the field of over 60 cars, but a promising race ended for the Florida driver on lap 165. Unfortunately, the final rundown will show Anderson with a 27th-place finish. “I had an awesome race car,” said Anderson, who led 26 laps on Sunday. “We just got pitted out of sequence. I thought more people would stay out and the whole field pitted when we were leading that one time. I figured if we could get about 20 laps, we’d be ok. And we did. So we came in and got hung in the back. 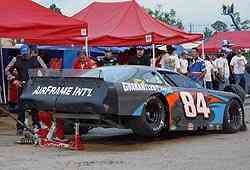 Wayne Anderson's #84 ended the night on jack stands. After qualifying 15th for his first Snowball Derby, 2005 Georgia Asphalt Series champion Joey Senter had his sights set on a strong finish. But Snowball debuts seem to be either pleasing or frustrating, and for Senter it was the latter. A crash early in the race put a damper on Senter’s Snowball weekend. Undeterred, Senter is already looking forward to next year’s Snowball. “We hit pretty hard,” said Senter. “I got into David Hole, then somebody got into me and spun me around. It was just a racing deal. 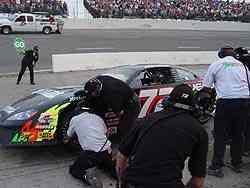 Justin Drawdy's car sits stalled on pit road on Sunday. The DNF was hard to take. But Drawdy isn’t hanging his head too low. He’s already looking past the short off-season to next year. “Hopefully 2006 will be a better year for us,” Drawdy said. “Now we can close the chapter on 2005 and open up a new one with Speedfest in January. so I went down there and did what we had to do. “I don’t think we lost but maybe one spot all day. I guess that isn’t bad for a racecar driver turned tire changer. A fourth-place finish for Augie Grill would normally have left the driver excited about such a strong result. Racing with the leaders all afternoon left Grill in a position for a top-five finish and that’s just what he got. After the race though, Grill was more disappointed about contact with Landon Cassill late in the event than happy about his fourth-place finish. “My car was good. The car was good the whole race,” said Grill. 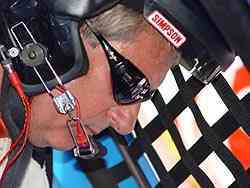 “But I hate that I got into Landon Cassill with about 15 or 20 to go. The car just wasn’t turning as well as it was all day. I was hoping to get up and race with Eddie (Mercer) and Steven (Wallace), but it wasn’t meant to be I guess. It has been a few years since Jason Hogan has competed in the Snowball Derby as a driver. But the last few years, he’s been around the track. 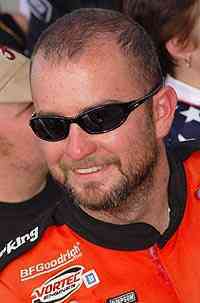 Last year, he was a part of the winning Richie Wauters team with driver Steve Wallace. He was again a part of the Wauters team this year, but when it came time to race, he was drafted by the #16 Bob Blount team with driver Bobby Gill to change tires. Jason Hogan (center) gets ready to change tires for Bobby Gill. Dave Mader III has been around long enough to know that some years, you are on, while other years, you are just a little bit off. “I think he thought or somebody told him there was more space there than there really was. When his spotter cleared him he just came down. It wasn’t on purpose but it happened. I wheel hopped his left rear and it bent something on my right front. Even though he felt bad about the Cassill incident, Grill could still smile about his top five run. With a top five run in this year’s Snowball experience, what would Grill grade his effort? 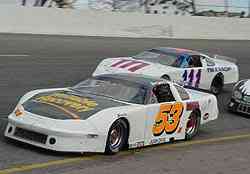 the ill-handling car, Mader was will able to come home with a lead-lap, 13th-placce finish. “You just try to be a hero. We just weren’t that good today. We made up two laps. We finished 13th. Gosh, I’m tickled to death. 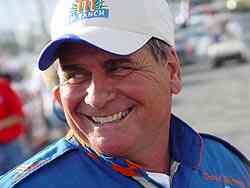 Three-time USAR Pro Cup champion Bobby Gill did his talking with his race car at the Snowball Derby. He posted decent times in practice all weekend and qualified in the middle of the pack. Surely no one expected him to make much noise in the race, right? Gill didn’t need to be fast all weekend, just in the race. He stayed out of trouble and worked his way through traffic at a steady pace to capture fifth place, his best finish ever in the Snowball Derby. Although he was satisfied with his top five run, Gill knows he could’ve had more. Dave Mader III struggled on Sunday. This was one of Mader’s off years. But that didn’t stop him from making the most out of his Derby. Gill admits he had to be a little lucky to have such a good run on Sunday. Things were looking rather bleak for David Rogers on Saturday morning. That is when his #11 crashed after contact with another car in morning practice. The damage was extensive, but not bad enough to keep him out of the starting lineup. 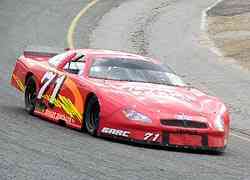 Rogers made it on Sunday, and finished 23rd, five laps down. “We are real lucky just to be able to get the car here,” said Rogers. “The guys worked really hard to get the car fixed. If we would have been as bad as we were tore up at any other race, we would have loaded up and went home. Rogers had to make a couple of green-flag stops after his ride started smoking thanks to a leaky oil line. However, he got back out on the track and finished the race. Like a true veteran though, he got back out on the track and finished the race in the right way. “I decided to ride and stay out of everyone’s way,” added Rogers. “We were four or five laps down. I know what this thing means to everyone that is here and racing. I respect racing too much to get right up there in the middle of it all. If the Snowball Derby winner was to be determined by popularity, either actual winner Eddie Mercer or Junior Niedecken would take the title. Unfortunately for Niedecken, the race is won or lost on the track, and this year’s running of the Derby. Niedecken slowed short of the halfway point in the race and pulled his #99 machine behind pit wall. His 26th Snowball Derby wasn’t one that goes on record as one of the best ones, but Niedecken isn’t going to give up. While Eddie was celebrating in victory lane, he was still unaware of what had happened, until he went to look at the damage done to his car earlier in the race. "I remember looking at it (fuel valve) and asking one of my crew guys how the heck they got fuel in there", Eddie said, "and when they told me what Stevie did, I was a little upset. I'm sure glad I didn't know about it until after the race. I wanted to win real bad, but I sure don't want anybody getting hurt especially my little brother". On Tuesday night, the Mercer family, friends and crew gathered together to celebrate their big win at a local restaurant. They used the opportunity to present Stevie with a special award for his bravery and going above and beyond the call of duty. "My sister Wanda over at Compu Graphix made me up a little trophy called the Gas Guzzler Award for all the fuel I swallowed. She presented it to me in front of everybody. It was real neat." said Stevie. "I'm just so happy for Eddie, I'm glad it's over. Now my main concern is what to get him for Christmas, you know, what do you get for a guy that has everything". However, things changed quickly for Jurkovic when Ken McFarland’s car was deemed illegal after the last chance race and Jurkovic was moved up and eventually into the Derby. Come Sunday, Jurkovic just rode around and learned how to drive the 300-lap Derby race, being that it was Jurkovic’s first trip to the half-mile. “We had a good car. We just made some bad decisions there,” said Jurkovic. “I am just glad to be here and glad to be in one piece. We will come back next year. “We have never been here before this year. I’ve never even seen the racetrack. “It is a tough little racetrack. I have never seen a place like this. Cywinski warned me on the deal and gave me a heads up on what to expect. I guess until you come here, you can never understand what it is telling you. 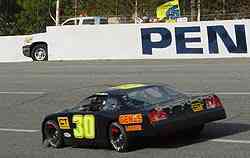 Patience is an attribute needed to have a successful run in the Snowball Derby at Five Flag Speedway (FL). Jay Middleton had that covered, for this year’s running of the annual short track race. However, he didn’t foresee an unusual problem with a shock that would ruin his day and lead to a 35th-place finish. “We never really got hold of the car all weekend,” said Bradberry. “In the race, we were going to try to late pit everybody because my car just wasn’t as good as everybody else’s. So we thought that could get us up there. 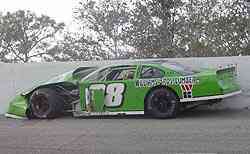 My car was so good at the end, but I got caught up in a wreck there and there wasn’t anything I could do. “Some guys got together ahead of me, everybody got on the brakes. Somebody got into Johnny Brazier and then I hit Brazier. Then somebody got into the back of me. It was just a racing deal. Now that David Hole took care of winning the 100 lap Snowflake Pro Late Model event in 2004, all that’s left for him to complete the Snowball Derby weekend trophy case is to win the crown jewel 300 lap Super Late Model race. First, Hole has to finish a Derby. Hole was the victim of circumstances in a pileup early in Sunday’s Snowball Derby that ruined his chances for another year. “It was another one of those bad luck deals,” said Hole. “They all wrecked in front of me in three and four. I got slowed down no problem but the guy behind me didn’t and nailed me and turned me sideways. 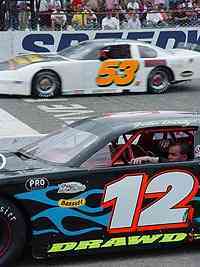 I think I hit Bobby Gill because he couldn’t slow down and hit my left front and broke the tie rod. There was a moment on Saturday that Boris Jurkovic and his #53 team started loading up their trailer to head home. They failed to make the Snowball Derby field through qualifying and finished one spot out of the transfer spot in Saturday night’s last chance race. Getting taken out in a crash is frustrating for any driver. Being involved in a crash early in a race is even more frustrating. To crash early in the Snowball Derby; it’s even worse. That’s why Ricky Turner’s frustrations are understandable. Turner was involved in an incident between turns three and four just 25 laps into the Snowball Derby. The crash destroyed his #28 car and left the driver steaming. Ricky Turner's day ended early, against the wall. couple cars get together up in front of me and I got run into from the back, that’s about all I know happened. Charlie Bradberry knew he didn’t have a car good enough to win the Snowball Derby on Sunday afternoon. That still didn’t mean that he wasn’t going to try. Bradberry came in for tires late in the race to hopefully pass cars on older tires in the closing laps, but the plan backfired as an incident with about 25 laps to go forced Bradberry to come from the rear again. He fought back all the way to 11th at the end of the race, but being just outside the top-10 was a disappointment for the 2003 Snowball Derby champion. “We were just out there riding around,” said Middleton. “We came out there during the race and it starting doing this funny thing. What ended up happening was the left front shock was blown out. We put a new one on there and it lasted for about five laps and did the same thing. It did the same thing at New Smyrna last week. The parts failure was one that Middleton had never experienced before, and not something that his team could have prevented either. “It's weird because as you turn the car to the left I can feel there bound letting up on the shock. It is real disappointing. I know everything that goes on this car and we worked so hard this weekend. We don't build our shocks in house and I don't know what the problem is there. It just makes us look bad. We have six weeks to figure it out. Jay Middleton's crew goes to work to try and replace the right front shock.